James C. Cobb is Spalding Distinguished Professor of History at the University of Georgia. 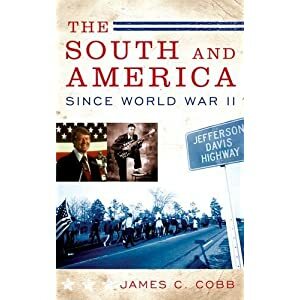 This piece is adapted from his new book, "The South and America since World War II," published this month by Oxford University Press. The White Citizens’ Council was formed in July 1954 in Indianola, a little north of Yazoo City in the heart of the Mississippi Delta, by a World War II veteran and plantation manager, Robert B. “Tut” Patterson, and some local businessmen and politicos. The council organizers had been inspired by a speech by Judge Tom Brady, also a Mississippian, who called on Southern whites to mount an organized resistance campaign against the Supreme Court’s integration decree. The Council spread across, and ultimately out of, Mississippi, generally attracting the white economic and political elites of the Deep South’s Black Belt counties but later making some inroads among blue-collar whites in the cities as well. The councils said that if we buried our heads in the sand long enough, the problem would go away. It was the technique of the big lie, like Hitler: tell it often enough and everybody will believe it. It finally got to the point where bank presidents and leading physicians were afraid to speak their honest opinions, because of this monster among us. What is so striking about Gov. Barbour's description of how the Citizens’ Council supposedly kept Yazoo City Klan-free is that it actually describes how the Council operated at the local level to keep blacks from pursuing their civil rights. Take, for example, the following incident which occurred, of all places, in Yazoo City. On August 5, 1955 the local NAACP chapter submitted a petition bearing fifty-three signatures to the school board asking for immediate desegregation of all schools. Stunned that the supposedly well-treated, contented black citizenry of Yazoo City would make such a move, the local Citizens’ Council move swiftly. The first step was to run a large advertisement in the Yazoo City Herald listing the names of the petitioners, who had already been identified in the paper's account of the petition being filed. Most of the petitioners were black professionals, businessmen, and tradesmen who seemed to have achieved a measure of economic independence that promised to insulate them from white pressure and coercion. It soon became obvious, however, that NAACP leaders had underestimated the amount of economic influence the local whites still enjoyed over members of the black middle class in Mississippi. One by one, those who signed the petition lost their jobs or whatever "business" or "trade" they had with whites. Some blacks move quickly to remove their names from the list. Others held out but eventually followed suit. Many of those who removed their names found it impossible to get their old jobs back, nor could they find new employment. Many left town altogether. Only those who were totally dependent on the black community for their incomes managed to survive economically. By the end of the year only two names remained on the petition; both belong to people who had already left town. And NAACP officials admitted that the local chapter had lost members as a result of the petition drive. "We expected pressure," said another, "but not this much. We just weren't prepared for it." White Mississippians were busily engaged in this pursuit in 1955. In May, shortly before the Supreme Court released its ruling in Brown II, Rev. George W. Lee was shot to death in Belzoni after registering to vote and urging his congregation and other black citizens to do the same. On August 13 Lamar Smith, a World II veteran who had also encouraged black voter registration, was shot dead in broad daylight on the crowded Brookhaven courthouse lawn. No arrests were made in the Lee case, and though the sheriff had seen a white man leaving the scene “with blood all over him,” Smith’s accused slayer went free when no witnesses would come forward. Two weeks after Smith was killed Mississippi produced yet another racial slaying, this one so brutal and outrageous that it would begin to awaken the world to the savagery of some white Southerners’ racial passions and the hopeless vulnerability of blacks who lived virtually at the mercy of those passions. Roy Bryant and J. W. Milam, the summarily acquitted and subsequently self-confessed slayers of the fourteen-year-old Emmett Till, seemed better candidates for the Klan than the Citizens’ Council, but both their heinous act and the closing of the ranks of even supposedly "better element" local whites around them reflected a climate of hatred and fear that was arguably more the handiwork of the latter than the former. In the immediate aftermath of the trial, the official Council newspaper accused NAACP critics of the verdict of trying to “replace American concepts of justice with those of the African Congo of centuries past." By way of follow-up on the enlightened business community of Yazoo City, scarcely a decade after the NAACP challenge to segregation had been repulsed, the ultimate refusal of African Americans in Mississippi or elsewhere to knuckle under to such strong-arm tactics had led to the landmark legislation that brought long-overdue political empowerment to the previously disfranchised local black majority. By then the mechanical cotton picker had drastically reduced the demand for black agricultural labor and blacks' newfound clout at the ballot box threatened the white supremacy that the Citizens’ Council had promised but failed to preserve. Accordingly, Yazoo County's development leaders now made no secret of the fact that the new industrial jobs they were trying to bring in would be for whites only. Where white economic leverage was once employed to keep blacks in place, it was now being utilized to force them out of the area altogether. For the record, this would have been roughly the same time that the revisionist Gov. Barbour recalls as not "being that bad” in Yazoo.